Freeman air temperature was -16 ℃ and the snow surface temperature was -23 ℃. Yeap, it was cold. Fortunately, winds were light from the north. That made it easier to manage the cold conditions. Snow was creamy and dense at north and northeast aspects, but we found and rode nice POW at east aspects. East aspects were sheltered from Northwest winds that hammered Idaho Central Mountains when the cold front moved through a day ago. There are a few Snotel sites that have anemometers, and one of those is Mores Creek Summit Snotel. Although, Snotel sites by design are located at wind sheltered locations. So when the Snotel sites register the wind, it means that the wind is blowing hard through the landscape. Check the wind event at Mores Creek Summit from December 15 through December 17. Notice from the chart that the wind was blowing from the west through northwest (200-320 Degrees). Today there were four parties at Freeman Peak. Two of those parties were father and son. There was still a lot of brush at the bottom of drainages, but with careful selection, most brush could be avoided. No evidence of instability was observed, with the exception of a steep rock spine with a small slab release. But it looked more like a localized terrain shallow slab release associated with the wind event. Before looking at the development of the snowpack we did a run on a low angle mid-elevation meadow. After quenching our thirst for pow turns, we were eager to get higher at Freeman Peak and search for a snowpit site. Selecting a snowpit site requires that we weigh what type of information is the most relevant for the tour of the day. The tour planning reflected that we must evaluate the basal weak layer, as well the two near surface weak layer identified last December 8. Observation from early December at Mores Creek Summit suggests that basal weak layers developed primarily at slopes with some north aspects above 7000 feet. Furthermore, the tour plan required evaluating the impact of northerly winds on the skiing surface and avalanche stability. We needed to answer the following questions: Has the wind created wind slabs and loaded the snowpack? Were weak layers buried under the wind slab? 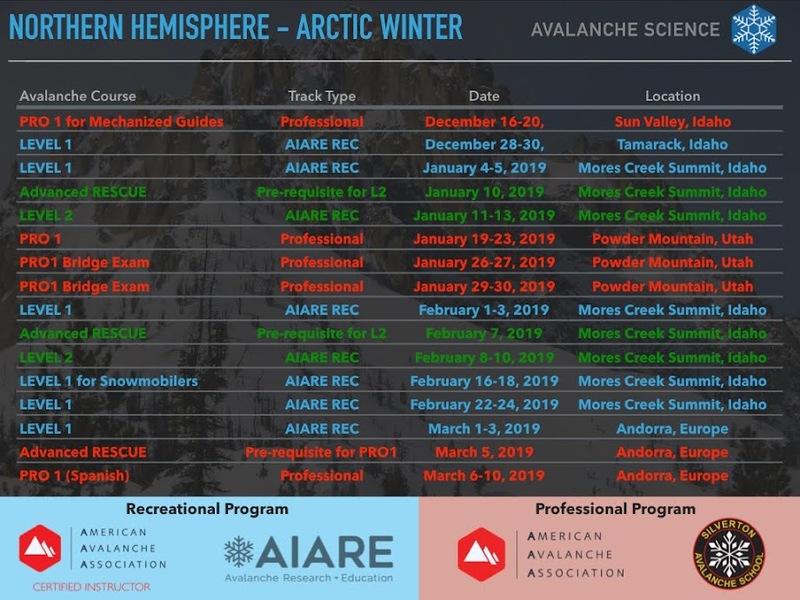 The selected snowpit site attempted to address previous concerns with the snowpack and provide information about the recent meteorology events (wind and precipitation). The snowpack at the snow-pit selected location had a depth of 115 cms and progressive hardness from Fist to 1-Finger at the bottom. The snowpit at confirmed that weak layers identified last Sunday, December's 11 have bonded to the snowpack. The basal facets (depth hoar) were not reactive. As you might recall from a previous post, during Thursday-December 8, free water became available in the snowpack and it percolated to the basal layer. The basal layer now consists of a mix of facets bonded by a crust at Mores Creek Summit (MCS) sites with elevations at or below 7500 feet. Today we identified two new weak layers, one at 23 cm and the other at 30 cm from the snow surface. Both weak layers repeatedly produced easy compression failures (CTEQ1-SP). These two NEW weak layers did not show evidence of propagation propensity at all. Both weak layers consisted of precipitation crystals, and it is reasonable to expect that they will sinter and bond to the rest of the snowpack during the next few days, although the current cold temperatures will be slowing down the sintering and bonding process. The top 10-15 cms of snow at MCS consist of a mix of precipitation particles and NSF crystals. We will have to pay close attention to this new weak layer undergoing advance facetting. Two storms are forecasted for Central Idaho Mountains for next week. It is likely that the new snow will be precipitating above this layer of Near-surface-facets (NSF). The current extended cold temperatures might result in a pretty widespread event, in which an NSF weak layer will be present at many aspects and elevations through are regional mountains. 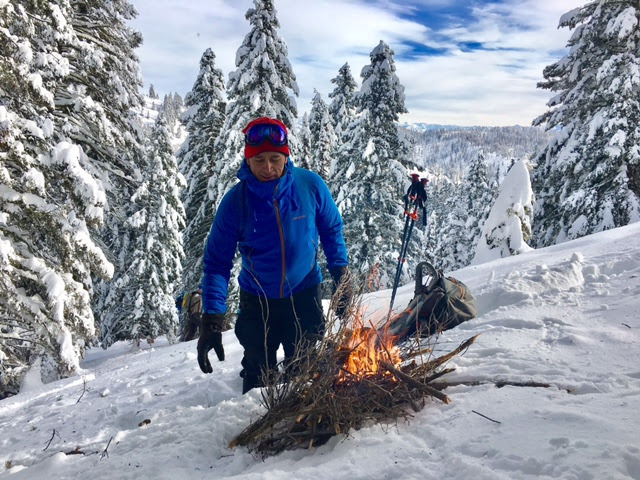 A good skill to practice during the winter is to be able to light a fire in the snow. It works great to have a cigar lighter (regular lighters do not work well at elevation and cold temp) and wax impregnated toilet paper. During equipment breakdown or another unfortunate event, having this skill could change the experience from an uncomfortable to a very pleasant one! Cold days like today presented an opportunity to practice fire starting above snow surface skill. Thus, during our "Merienda" (https://en.wikipedia.org/wiki/Merienda) we enjoyed the comfort of a warm fire. With six ski tracks on the slope below, Delta and Echo had a frank discussion. Delta asked, “What do you want to do?” After discussing the potential wind pillow skiers’ right, Echo said, “Let’s burn a run and go back (to their previous slope).” In Delta’s words, “we forfeited digging a pit”. Below, there was lots of hooting and hollering in excitement from the great powder. Echo dropped in and the slope avalanched on his fourth turn. Delta yelled, “Avalanche” and kept his eyes on his Echo until he disappeared.